A number of atmospheric agents affect the durability of any manufactured article, including our finishes. These agents include salt, polution, wind, ice, heat, light, steam and water. Most of these agents are tested through the Extreme Exposure test, while other agents are tested in laboratory using purpose built machines. The Extreme Exposure test is the most important of all the tests as it measures our finishes' performance in real conditions, which no machine can replicate exactly. Decorative Imaging's specialist powder coating finishes comply with the international standard for powder coating, Qualicoat. Decorative Imaging finishes are a highly durable marine grade powder coating. 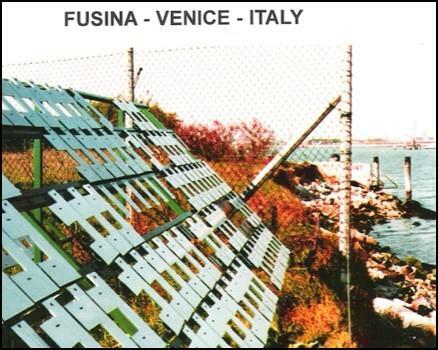 These tests set out the limits in which a finish can change in colour under harsh UV conditions. The higher the class of coating, the more rigorous the extreme exposure testing. The Extreme Exposure test involves our samples being laid out on a frame facing up with part of the sample covered for the time period required. The exposed part of the sample's surface is measured regularly for any change against the covered part of the sample surface, to determine and rate any change. 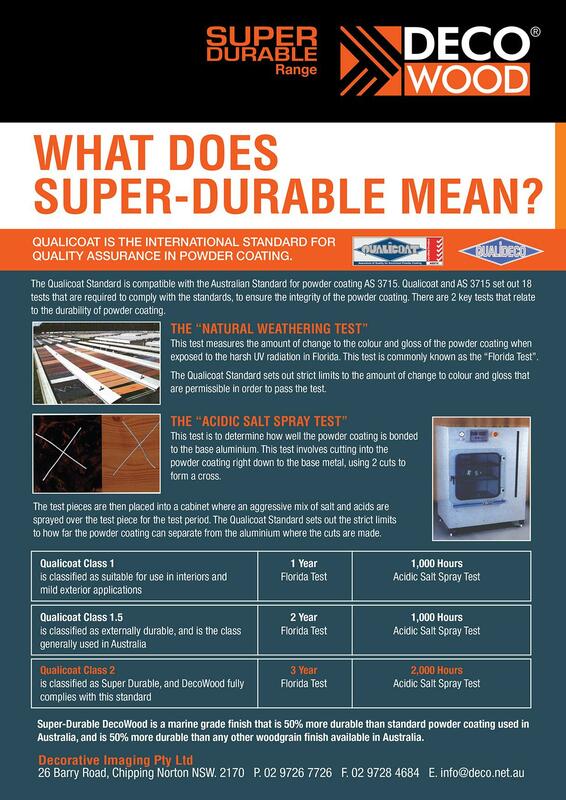 The Qualicoat Standard sets out three levels of durability. Classes 1.0, 1.5, and 2.0. All DecoWood finishes are Class 2.0 Super Durable finishes. DecoWood is 50% more durable than standard aluminium powder coat finishes. Decorative Imaging's finishes perform very well in these environments and conditions, as indicated by the image below. 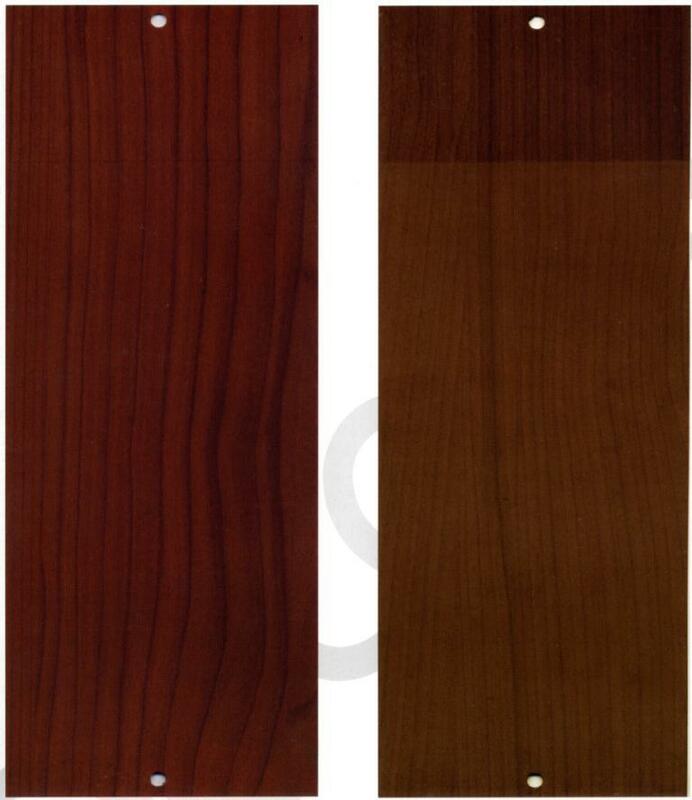 The left sample is a DecoWood sample, and the the right sample is a Non-DecoWood sample. These samples were exposed to the natural conditions in Florida for one year. As you can see, the difference between the covered and exposed sections of the DecoWood sample is hardly noticeable. However on the sample of the Non-DecoWood finish, the difference is very obvious. In addition, the DecoWood sample retained 90% of its gloss level throughout the trial period, whilst the Non-DecoWood sample was left with only 52% of its original gloss level.